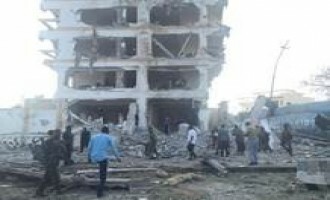 The Shabaab al-Mujahideen Movement claimed killing over 40 people in a suicide bombing followed by a suicide raid at the Ambassador Hotel in the Somali capital, Mogadishu. 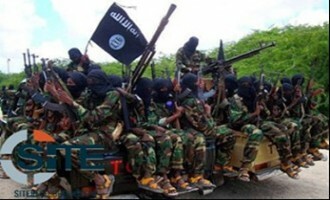 The Shabaab al-Mujahideen Movement, al-Qaeda’s (AQ) branch in Somalia, claimed multiple “fierce attacks” targeting military and government entities in several areas in Somalia, including the country’s capital, Mogadishu, killing 23 and wounding the mayor of Burdhubo. 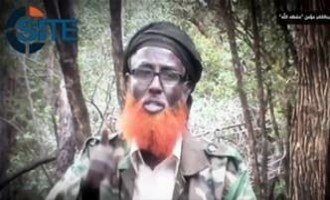 Shabaab Fighter Calls Muslims to Battlefield in Chant in "Mujahideen Moments 10"
The Shabaab al-Mujahideen Movement, al-Qaeda's branch in Somalia, released the tenth episode in its "Mujahideen Moments" series, featuring in it a Kenyan fighter calling Muslims to the battlefield in a chant. 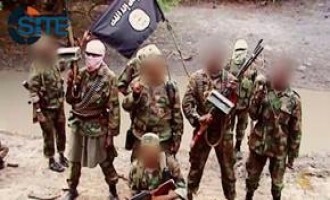 The Shabaab al-Mujahaideen Movement, al-Qaeda’s branch in Somalia, claimed an attack on Halgan town, near Beledweyne city in Hiraan province, Central Somalia; as well as repelling American forces 60 kilometers southwest of the capital, Mogadishu. The Shabaab al-Mujahideen Movement, al-Qaeda’s branch in Somalia, claimed thwarting a ground and air assault by U.S. forces on the town of Sabib, south of the capital, Mogadishu. The Shabaab al-Mujahideen Movement, al-Qaeda's branch in Somalia, claimed thwarting a raid by U.S. Special Forces in Toratorow, outside the capital, Mogadishu. The Shabaab al-Mujahideen Movement, al-Qaeda's branch in Somalia, claimed killing 11 in a suicide operation on traffic police headquarters in Shangani district in the capital, Mogadishu. 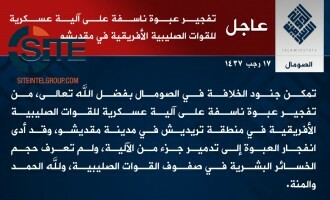 The Islamic State (IS) claimed an attack on Somali intelligence forces near the capital city of Mogadishu. The Shabaab al-Mujahideen Movement, al-Qaeda's branch in Somalia, claimed 69 attacks between February 10 and March 9, 2016, including a suicide bombing with a VBIED outside a police station in Mogadishu, and the car bombings and raid at the SYL Hotel, also in the capital. 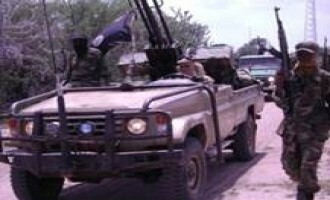 The Shabaab al-Mujahideen Movement claimed shelling AMISOM forces near Mogadishu, and taking “complete control” over the Ruunirgood town in Middle Shabelle. In its al-Naba weekly newspaper, the Islamic State (IS) reported on the circumstances of the assassination of Shabaab defector Abu Nu'man Yintari in Somalia, and discussed engaging Shi'ites in a war of attrition. 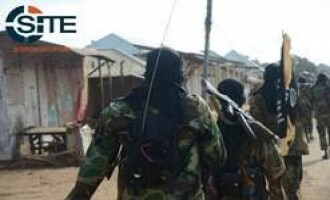 The Shabaab al-Mujahideen movement reported on its conflict mediation between two tribes in the Lower Shabelle region of Somalia. 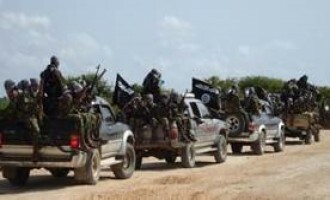 The Shabaab al-Mujahideen Movement, al-Qaeda’s affiliate in Somalia, claimed killing “dozens” from government militia forces in the outskirts of Baidoa city. An alleged Islamic State (IS) militant in Somalia claimed “a large presence” of IS fighters throughout Somalia, and that “upcoming operations” would anger al-Qaeda’s (AQ) Somali affiliate, the Shabaab al-Mujahideen Movement. Shortly after the Islamic State (IS) claimed its first attack in Somalia, a jihadist posted a video of a young boy calling on fighters in the country to pledge allegiance to IS leader Abu Bakr al-Baghdadi. The Islamic State (IS) claimed its first attack in Somalia, a bombing on an AMISOM military vehicle in the capital, Mogadishu. 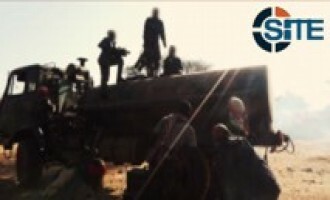 The Shabaab al-Mujahideen Movement, al-Qaeda’s (AQ) branch in Somalia, released a photo report showing aid delivery in Shabaab-controlled areas of Mudug. 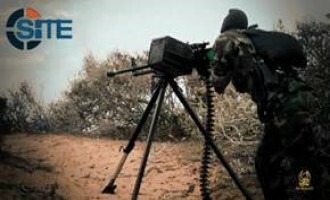 The Shabaab al-Mujahideen Movement, al-Qaeda's branch in Somalia, released a video focused on the January 15, 2016, raid at a KDF camp in El-Adde, showing scenes from the clashes, and footage of some of those Kenyan soldiers captured alive. 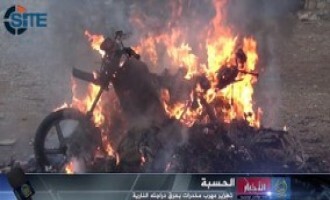 The Shabaab al-Mujahideen movement reported several attacks, including a confrontation that prevented the landing of a US airdrop on the outskirts of Kismayo city in Juba province. 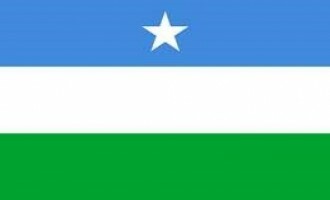 The Shabaab al-Mujahideen Movement claimed credit for a "powerful explosion" that killed Said Yusuf Ali, a financial director for the Puntland government in Somalia's Mudug region. 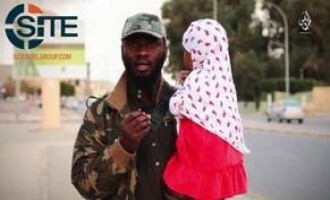 Two English-speaking Islamic State (IS) fighters, one Nigerian and the other Somali, promoted the group's implementation of Shariah in a video from the IS' Tripoli Province in Libya. 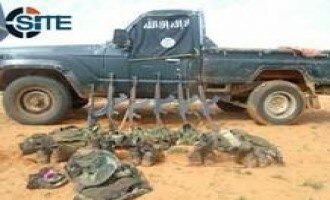 The Shabaab al-Mujahideen Movement claimed killing over 73 Somali troops in an attack on the Laanta-Buure military base, southwest of the capital, Mogadishu, and posted photos of the vehicles and weapons taken as war spoils. 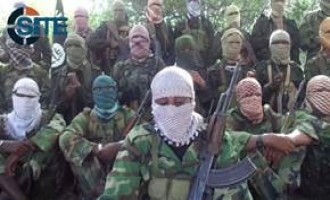 The Shabaab al-Mujahideen Movement, al-Qaeda's branch in Somalia, claimed killing a dozen Kenyan soldiers in an ambush in the area of Hiyo, near the city of Afmadow in Juba province, southern Somalia. 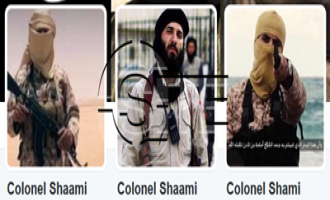 A pro-Islamic State (IS) Twitter account detailed what he alleged to be the Shabaab al-Mujahideen Movement’s collaboration with the Puntland State of Somalia against IS in the region. 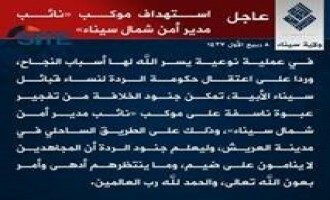 An alleged former Shabaab al-Mujahideen Movement member now with the Islamic State (IS) in Yemen made an “exclusive” claim that multiple tribes in Somalia had switched allegiance from the Shabaab to IS. The Shabaab al-Mujahideen Movement claimed killing 10 police officers in a car bombing outside a police station in the Somali capital, Mogadishu, in addition to killing and wounding a number of Ethiopian and Somali soldiers in Baidoa. 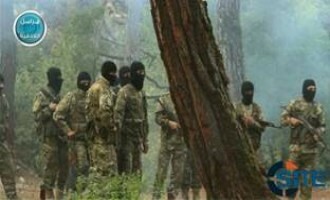 The Shabaab al-Mujahideen Movement claimed that it foiled an airdrop operation by unidentified foreign forces in Awdheegle, located in Somalia's Lower Shabelle region. 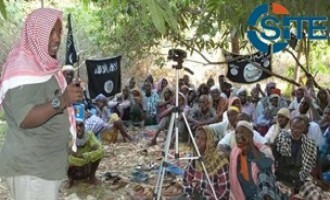 The Shabaab al-Mujahideen Movement, al-Qaeda’s (AQ) branch in Somalia, released a photo report showing medical treatment to villagers and their livestock in southwest Somalia. The Shabaab al-Mujahideen Movement, al-Qaeda's branch in Somalia, claimed 50 attacks between January 11 and February 7, 2016, including the deadly raid on KDF soldiers at an AMISOM base in El-Adde, and the suicide raid at the Beach View Hotel on Lido beach in Mogadishu. 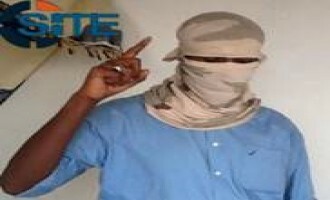 A jihadist defended the attacks carried out by the Shabaab al-Mujahideen Movement at hotels in Mogadishu, claiming that they are not civilian targets, as the Somali government portrays them, but are "headquarters of the enemy". The Shabaab al-Mujahideen Movement, al-Qaeda’s branch in Somalia, provided additional details about its February 26, 2016 raid on the Somali Youth League (SYL) hotel in Mogadishu. The Shabaab al-Mujahideen Movement, al-Qaeda’s branch in Somalia, claimed an immersive suicide attack on the Somali Youth League (SYL) hotel in Mogadishu. 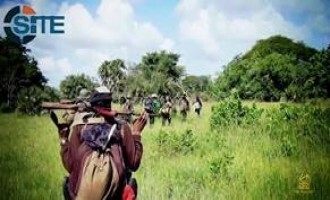 The Shabaab al-Mujahideen Movement, al-Qaeda's branch in Somalia, claimed killing dozens of AMISOM forces in an ambush near Baledogle Military Airfield in Lower Shabelle region. 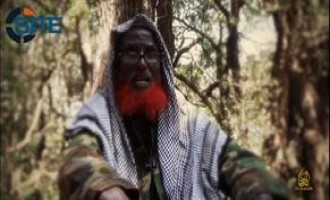 Ahmad Iman Ali, a Kenyan official in the Shabaab al-Mujahideen Movement, delivered a lecture threatening attacks in Kenya, while claiming to wear the clothing of a KDF soldier killed in the January 15, 2016, attack on an AMISOM base in Somalia's Gedo region. 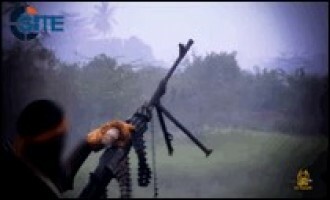 The Shabaab al-Mujahideen Movement, al-Qaeda's branch in Somalia, claimed killing more than 35 Somali troops in an overnight offensive in Afgoye district of Lower Shabelle region. The Shabaab al-Mujahideen Movement, al-Qaeda’s branch in Somalia, claimed the assassination of former Somali Defense Minister Muhiyadin Mohamed, and recovering a crashed American drone. The Shabaab al-Mujahideen Movement claimed credit for the February 2, 2016, bombing on a plane bound for Djibouti, declaring that it came within a series of operations specifically targeting “Western and apostate intelligence infrastructure”. An alleged Somali Islamic State (IS) fighter in Yemen criticized what he expressed to be IS’ neglect of pledged defectors from the Shabaab al-Mujahideen Movement, al-Qaeda’s branch in Somalia. Syrian opposition fighters and supporters stressed urgency joining Aleppo battlefronts amid a massive offensive by pro-regime forces in the province. The Shabaab al-Mujahideen Movement, al-Qaeda’s branch in Somalia, claimed a total of 60 attacks in that country and Kenya in a report on its military operations, civilian projects, and other activities for the Hijri month of Rabie al-Awwal 1437 (December 12, 2015 – January 10, 2016). 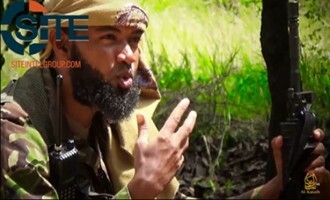 A Swahili-speaking fighter in the Shabaab al-Mujahideen Movement called Muslims to the Somali battlefield for training and jihad in the ninth episode of the series “Mujahideen Moments”. 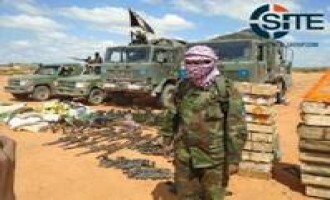 The Shabaab al-Mujahideen Movement issued a press release containing 134 photos, many of them gruesome, of the deadly attack on the AMISON base in the Gedo Region of Somalia. 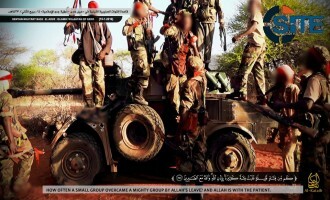 The Shabaab al-Mujahideen Movement, al-Qaeda’s branch in Somalia, published aftermath photos of its deadly attack on an AMISOM base in Gedo, showing dead and bloodied bodies of Kenyan soldiers, vehicles ablaze, fighters posing with war spoils, and soldiers taken captive. The Shabaab al-Mujahideen Movement, al-Qaeda’s branch in Somalia, issued a report on its military operations and civilian projects for the Hijri month of Muharram 1437 (October 14 – November 13, 2015), claiming a total of 56 attacks and 13 instances of Somali soldiers surrendering and “repenting”. 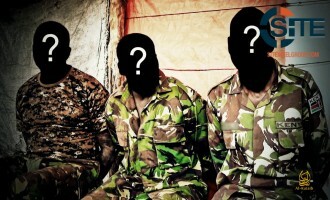 The Shabaab al-Mujahideen Movement released an audio message of two Kenya Defense Forces (KDF) soldiers taken hostage after the group’s storming of an AMISOM base in Somalia’s Gedo region on January 15, 2016. 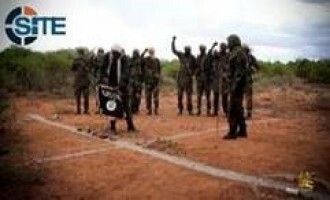 The Shabaab al-Mujahideen Movement issued a statement on the raid on a Kenyan base in Somalia’s Gedo region, announcing that over 100 soldiers were killed and some were captured alive. The Shabaab al-Mujahideen Movement, al-Qaeda’s branch in Somalia, claimed killing 63 Kenyan soldiers in a suicide bombing and raid by its Saleh al-Nabhani Battalion on a military base in Gedo. 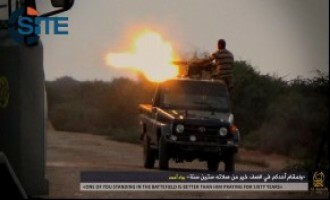 Two Somali fighters in an Islamic State (IS) division in Libya congratulated defectors from the Shabaab al-Mujahideen Movement in a video, and threatened Shabaab members who attack and kill them. 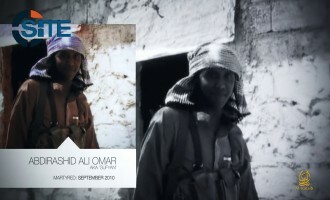 The Shabaab al-Mujahideen Movement, al-Qaeda’s branch in Somalia, released the second episode in its series on slain American fighters from Minnesota, and in this installment, encouraged black youths in the U.S. to convert to Islam and leave for the Somali battlefield. 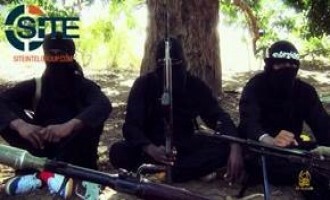 The Shabaab al-Mujahideen Movement claimed killing a “large number” of Kenyan forces in Kenya’s Lamu County, where the group has recently increased the number of its attacks, and executed two men in a public square in Somalia on charges of working for the Somali government. 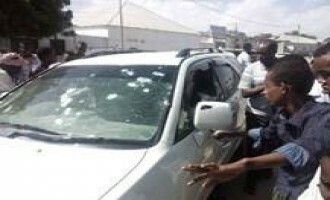 The Shabaab al-Mujahideen Movement reportedly killed an official in the Somali Central Bank and a Somali intelligence officer in two separate attacks in the Somali capital, Mogadishu. 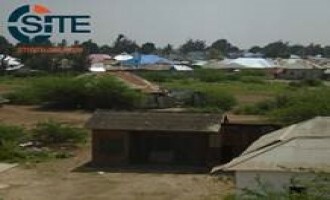 In reporting on “fierce clashes” between tribes in Beledweyne and Merca, Shahada News Agency portrayed such incidents as commonplace in Somali government- and African Union (AU)- controlled cities, but nonexistent in areas where the Shabaab al-Mujahideen Movement has power. 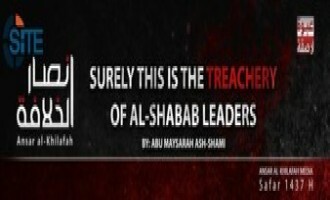 Islamic State (IS) supporters disseminated a document condemning the actions of Shabaab al-Mujahideen Movement leaders, and calling for them to denounce al-Qaeda (AQ). A Shabaab supporter on Twitter incited Somalis in Kenya to join the Shabaab al-Mujahideen Movement in wake of mass graves found along the Somali-Kenyan border. Pro-Islamic State (IS) jihadists distributed a video showing fighters in the Juba region of Somalia pledging allegiance to IS leader Abu Bakr al-Baghdadi, one of whom was allegedly killed afterwards by the Shabaab al-Mujahideen Movement. 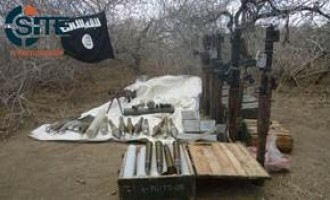 Jihadists in Somalia detailed the Shabaab al-Mujahideen Movement’s training and equipment investments on Twitter. 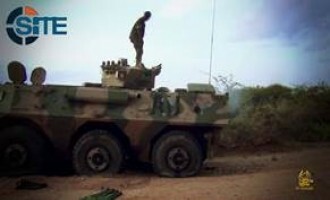 The Shabaab al-Mujahideen Movement reportedly attacked bases of Somali troops and a tanker belonging to Africa Union (AU) forces in Lower Shabelle region in southern Somalia. Pro-Islamic State (IS) jihadists circulated the “full story” of how the Shabaab al-Mujahideen Movement, a branch of al-Qaeda (AQ) in Somalia, killed its former deputy and implied impending revenge from IS. On November 25, 2015, IS fighters and supporters on Twitter circulated purported details on the death of Hussein Abdi Gedi, who was killed by Shabaab after defecting to IS. The circulated story described the assassination as “treacherous,” and claimed that his former body guard made contact with him under the pretense of “giving bay'ah [allegiance] to the Islamic State.” Once alone with Gedi and two others, the official opened fire, killing all three of them. 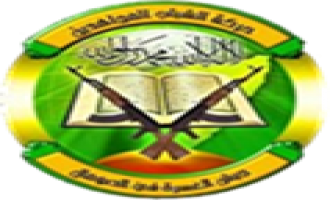 A jihadi supporter in Somalia defended the Shabaab al-Mujahideen Movement against claims from other jihadi supporters that the organization had become corrupt and power-hungry. 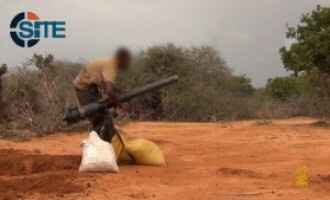 The Shabaab al-Mujahideen Movement claimed a mortar attack on a base of Puntland state forces on the outskirts of Bosaso. 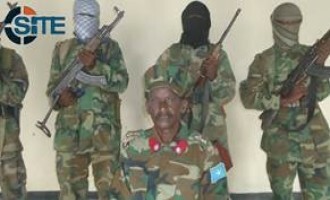 The Shabaab al-Mujahideen Movement reportedly retook a “strategic city” in central Somalia and killed 25 Somali forces at a military academy in Kismayo, in the south of the country. 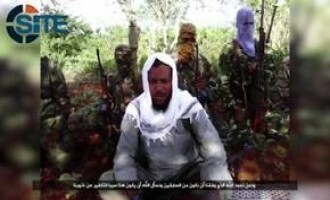 The Shabaab al-Mujahideen Movement, al-Qaeda’s branch in Somalia, released a video on the September 1, 2015, raid at an African Union (AU) base in Janale, and showing a captive Ugandan soldier. Jihadists distributed a video that shows what it describes as a group of fighters in Somalia pledging allegiance to Abu Bakr al-Baghdadi, the leader of the Islamic State and the “Caliph” of its alleged “Caliphate”. 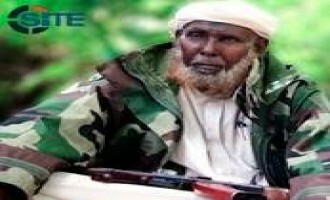 The Shabaab al-Mujahideen Movement, al-Qaeda’s branch in Somalia, issued a eulogy for Muhammad Ismael Yusuf, a scholar and a fighter who it noted had died at the age of 75 from a disease. 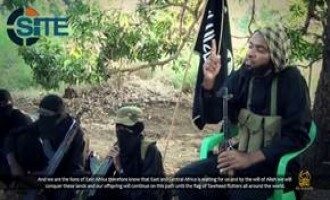 “Al-Muhajiroun - Emigrants of East Africa,” a pro-Shabaab al-Mujahideen Movement group, issued an English translation of an interview with its leader about jihad in Tanzania and Somalia, and the recent pledge by Shabaab fighters to the Islamic State (IS). 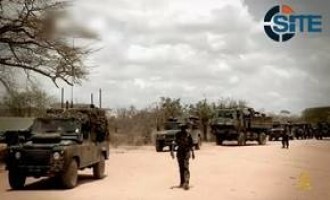 The Shabaab al-Mujahideen Movement reportedly killed dozens of U.S.-trained Somali forces near the Balli Dogle Military Airbase in Lower Shabelle region. 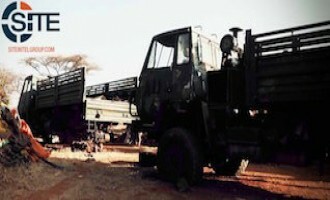 The Shabaab al-Mujahideen Movement reportedly killed 36 Ethiopian troops in an “intense attack” on their base in Somalia’s Bakool region, and also seized control over a base of Somali forces in the region. 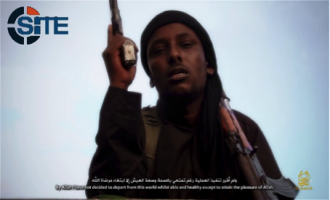 The Shabaab al-Mujahideen Movement, al-Qaeda’s branch in Somalia, released a video portraying jihad as a form of “tourism” and calling Muslims to immigrate to the battlefield. The Shabaab al-Mujahideen Movement claimed credit for the deadly attack at the Sahafi Hotel in the Somali capital, Mogadishu, and vowed there will be “no safe haven for apostates and crusaders in the Muslim lands of Somalia”. 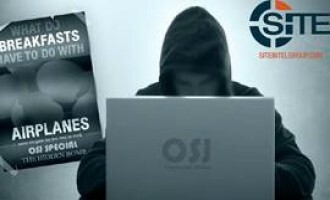 Jihadists on Twitter continued to discuss alleged missions by the Shabaab al-Mujahideen Movement to kill or arrest scores of its fighters in wake of Shabaab religious leader Abdul Qadr Mu’min and 20 others’ pledge to Islamic State (IS). 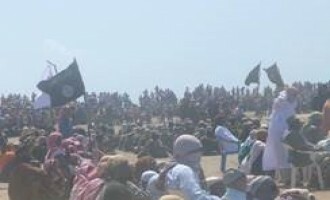 After the recent pledge to Islamic State (IS) from prominent religious official Abdul Qadr Mu’min and approximately 20 fighters of the Shabaab al-Mujahideen Movement, Twitter users claimed that al-Qaeda (AQ)-loyal Shabaab members began arresting those suspected of pledging to IS. A jihadist reported that a Somali member of two jihadi forums who later became a fighter for the Islamic State (IS) was killed on an IS fighting front. The recent pledge to the Islamic State (IS) from Abdul Qadr Mu’min, a religious official in the Shabaab al-Mujahideen Movement, along with at least 20 fighters has prompted fervent chatter from both pro-al-Qaeda (AQ) and pro-IS jihadists on social media. 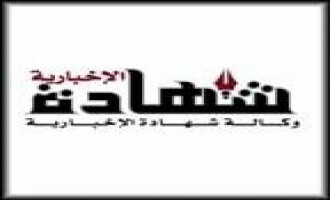 The Somalia-focused jihadi media group Shahada News Agency confirmed the pledge to Islamic State (IS) leader Abu Bakr al-Baghdadi by Abdul Qadr Mu’min, a religious official in the Shabaab al-Mujahideen Movement. 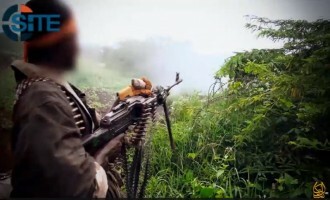 The Shabaab al-Mujahideen Movement claimed 55 attacks on Djiboutian, Ethiopian, Kenyan, Somali, and unidentified AMISOM forces between September 15 and October 12, 2015, and capturing a Somali soldier in what it called a “special operation”. Twitter accounts associated with the Islamic State (IS) and Somali militants have begun to circulate unconfirmed claims that a high-ranking member of the Shabaab al-Mujahideen Movement had pledged to IS. Chatter on Twitter has indicated what could be a growing divide among members of the Shabaab al-Mujahideen Movement amid a campaign by the Islamic State (IS) and its supporters to gain the group’s allegiance. 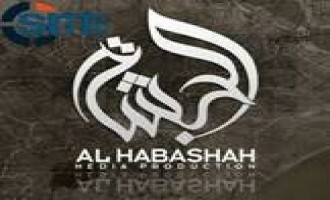 Islamic State (IS) supporters announced the creation of “Al Habashah Media Production,” a media group dedicated to supporting IS in the Somali language. The Shabaab al-Mujahideen Movement, al-Qaeda’s branch in Somalia, claimed credit for the assassination of an employee in the Somali Finance Ministry in front of his home in the capital, Mogadishu. 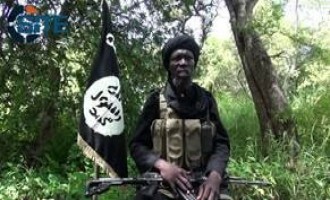 West Africa Province of the Islamic State (IS) in Nigeria released a video featuring a fighter urging his counterparts in the Somalia-based Shabaab al-Mujahideen Movement to pledge allegiance to IS leader Abu Bakr al-Baghdadi. 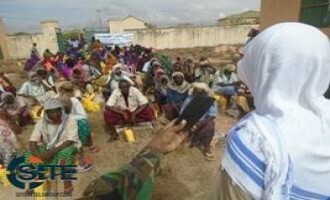 The Shabaab al-Mujahideen Movement, al-Qaeda’s branch Somalia, released a visual lecture by a group official, Ahmad Iman Ali, rallying fighters not to let their small numbers discourage them in battle, and mocking the U.S.’s Rewards for Justice program.